An update on Mary Evelyn Sorenson, the daughter of Alfred and Mae Sorenson. Between Ancestry’s Social Security Applications and Claims Index database and the death certificate of the person who had that Social Security Number, I had an idea that I’d found what had happened to my first cousin twice removed. 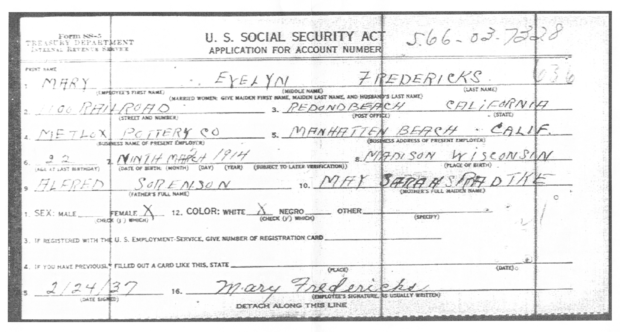 However, her death certificate did not list parents, so I wasn’t certain that I had records for the right person. Name matches the name of Mae Sorenson’s daughter in the daughter’s announced marriage to George Grantzow. That’s a lot of matching points. And unless someone took over her identity it’s the same woman who died in 1990, the S.S.N. and date of birth match the death certicate. I’m considering it pretty safe to assert these are all the same person. 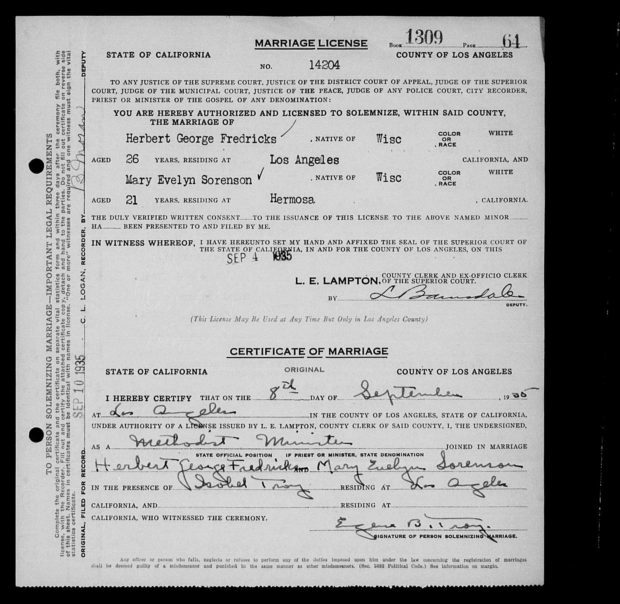 Armed with that information, I was able to find a marriage record for Mary Evelyn Sorenson and Herbert George Fredericks in Los Angeles from 1935. For some reason, Mary Sorenson thought her mother’s maiden name was Radtke. The other indication I have for Mae’s maiden name comes from Mae’s marriage record, which gave her name as Gibbons. She was raised in an orphanage, so I don’t know how accurate either name is. There’s still a lot of gaps in her life that I could research and document, in addition to better documenting the known events.